Miele PWT6089 and PT7189 Stacked Washer Dryer Combination from Gillmans Commercial Appliances. Miele Professional`s new washer-dryer stack is able to handle a full 16 kg of laundry per cycle on a footprint measuring only half a square metre. This version is ideally suited to hotels restaurants small businesses and other small commercial enterprises needing to wash mountains of laundry in the tightest of spaces. Thanks to a powerful heater rating of approx. 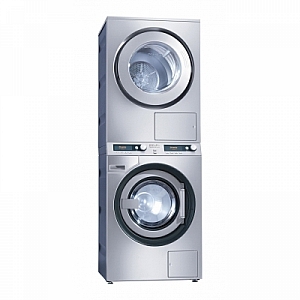 8 kW programmes cycles lasting less than an hour each are achieved on both the washer-extractor and the tumble dryer.